One sodium light still shining at corner of Forest and Holly. Lights being converted from "yellow sodium" to "white LED" in Bellingham. 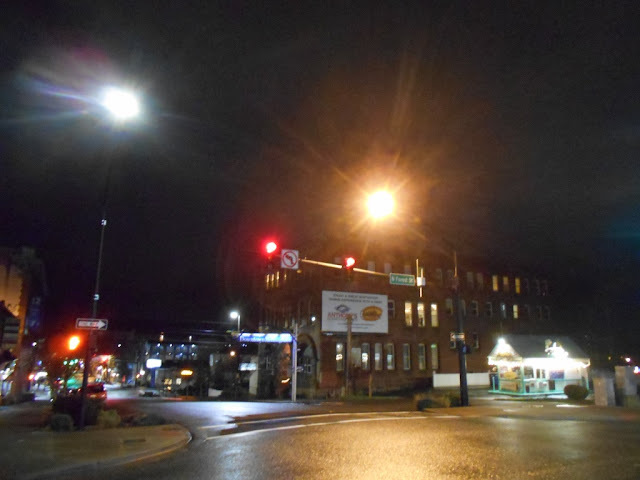 Bellingham is replacing most of it's streetlights with light emitting diode lights. Out go the older yellow sodium vapor, in come the white LED. Uses less energy. Some folks might miss the warm yellow glow, but the white seems good enough for me. The white is high tech. They say each light can be controlled from city hall via radio signal. Brightness can be adjusted and I assume that a status report on each light can be pulled up on a master map (I'd guess) on computer screens in city hall. That's whizzbang. I remember growing up in Pullman, WA. and watching the streetlights come on. They were mercury vapor which gives a metallic blue light. Sodium vapor, with it's soft yellow glow, was something I read about in other cities. It existed back then, but not where I grew up. Way back then, we even still had a few incandescent street lights. Mostly on back streets, like the dead end street our house was on. See more of my streetlight images on Flickr.